Luxury Bubbles, Oculus, is a blown glass colored plate with an organic casual shape. The unique shape is obtained by spinning the glass so fast that edges stretch in an uneven way. Twirl is a vase shaped by the glass master. Then, playng with "battuto" Tecnique, the layers of color inside the vase are brought to surface with a geometric shaded texture. Organic black glass vase with iridescent overlay. 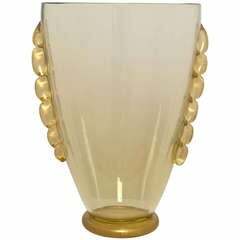 Beautiful 1970s Italian molded glass vase with geometric cut edges. Free worldwide shipping.